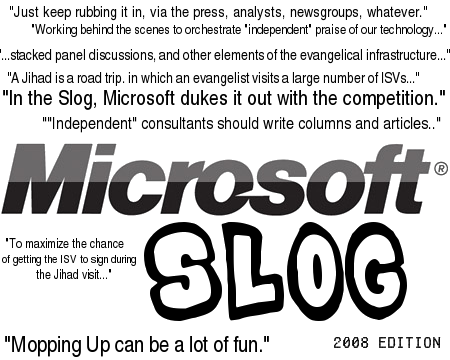 We wrote some days ago about Microsoft's "Slog" against VMware. This campaign continues and reaches new heights under a new domain which Microsoft now operates. It’s www.vmwarecostswaytoomuch.com (VMware Costs Too Much). Is this how a publicly-traded company should behave? About a year and a half ago, Microsoft tore down a site called “Linux Persona,” which was an ad hominem attack against GNU/Linux advocates. And it’s just one anti-GNU/Linux site among many more. Anti-ODF campaigns seem to be forgotten by some people as well [1, 2, 3, 4], especially now that Microsoft pretends to be a ‘buddy’ of ODF. With tactics like these, Microsoft should not be shocked to find critics. Point of information, the site does say “© 2008 Microsoft Corporation. All rights reserved” right at the bottom (below the Microsoft adverts). Thanks. I didn’t spot that immediately. Isn’t this exactly what this site does to Microsoft and Novell? I should mention it’s the same thing Apple does to Microsoft with their TV ads, and the TV ads actually reach a lot more people than some website that few people are likely to visit, especially had you not brought attention to it. This site is totally independent. Also, Microsoft and Novell have their own ‘special’ domains to promote SUSE at the expense of GNU/Linux. I don’t like Apple, either. @Dan: I’m not sure it’s surprising for a company to be advertising their product as better than the market leader, but yeah. Tell me when Red Hat launches a Web site just to point this out. Sorry, what does Red Hat have to do with this discussion? It has its own virtualisation technology to promote. Only Microsoft resorts to “Slog” or “guerrilla marketing”. Red Hat don’t have a specific virtualisation product. They offer it, but they don’t really compete in that market. I’m not sure why you think Microsoft are the only ones who resort to “guerrilla marketing”, and I’m not even sure why you class that as guerrilla – it doesn’t really fit the accepted definition of the term. Certainly I can think of about ten companies who’ve run similar campaigns off the top of my head without even looking. List 10 then, off the top of your head? Anyway, this site is largely about MS, not nike or coke.